Need a new rig for roadtripping? Check these options. Pros: Drop, pop, and start living with this detachable trailer camper that frees your vehicle for trailhead shuttles and beer runs. They’re small and light: Gas efficient. Cons: Contrary to the name, pop-ups don’t just “pop” up, but require a good 20 minutes of cranking, zipping, and snapping. Best for trips that include several-day stays. Drive Away: The Forest River Extreme Sports Package. Prices for newer models start at $13,500. Pros: If you’re looking for the shortest set-up and take down, these are a comfortable choice. Like the pop-tops, you can unhitch with ease, but won’t have to spend more than a couple of minutes making it habitable. There’s a wide range of styles and prices, from small teardrops towable by cars, to, mid-size travel trailers and massive fifth-wheel homes. Cons: Your options will depend on the ability of your vehicle to pull. Larger models with plumbing seem like a great choice until you’re chugging up a steep hill. Teardrops usually have the kitchen on the outside. Backing up on a narrow road to your super-secret campsite looks easy, until you try to do it with everyone watching. Drive Away: Boulder-based Colorado Teardrops Basedrop starts at $11,300; New fifth-wheels can start as low $30,000. Pros: Rooftop tents are having a big moment now, thanks to their versatility. They can attach to the top of most cars and the view from atop can’t be beat. Camping up high is great for cross breezes. Variations include full-tent styles from Tepui and the compact hard-case from Roofnest. Cons: While it’s nice to be able to take this off and store it, you might need some help. Even the lightest models weigh around 110 pounds, making it tough to take on and off alone. It’s also a bit of a scramble up and down when you wake up in the night needing to pee. 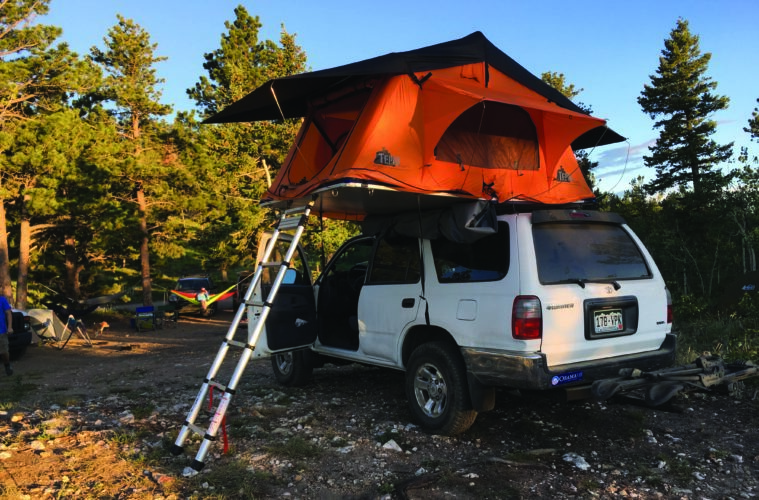 Drive Away: Tepui Kukenam Sky Tent starts at $1,425; Boulder based Roofnest Sparrow starts at $2,200. Pros: A far cry from the creepy, conversion van down by the river, custom camping vans like Sprinters and Sportsmobiles have become popular options with a range of choices. Self-contained, a van lets you clandestinely camp or boondock almost anywhere. Everything is within reach, and the headroom allows for bikes storage inside. Cons: Unlike the other options, you can unhitch and leave behind for day trips—, it all goes where you go. Initial investment is high so it’s worth calculating how many days a year you plan to spend on the move and take a few for a test drive before jumping on the vanwagon. Drive Away: ModVans CV1 starts at $85,000. Got cash to burn? The Merceded based Airstream Interstate Lounge starts at $166,000.